I’ve now transferred all the information to a database that can be searched via a web interface (see below), https://www.macinchem.org/mobsci/index.php. I've tried to tag all apps with appropriate comments so hopefully searching should identify the relevant applications. The site is available at https://www.macinchem.org/mobsci/index.php, I’ve started to categorise applications to aid navigation but I’d be interested to hear of any suggestions. Currently there are over 200 entries covering an extensive area of science, if I’ve missed any please let me know and I’ll add them. Search results can be refined as shown below. 3D Cell stain simulation Learn about the cell and all its structures using the new 3D Cell tool. Enjoy the ability to rotate the cell 360 degrees and zoom in on any cell structure. Choose from a list of cell structures to learn more about how each structure functions and relates to the other components of the cell. Dive even deeper and create your own stained cell image by using Molecular Probes™ products. 3D Molecules Edit&Drill designed to enable students to build, construct, modify and examine molecules in 3D. ACS Mobile provides up-to-the-minute access to recent peer-reviewed research publications across the Society's research journals, including the Journal of the American Chemical Society. The Aldrich Handbook of Fine Chemicals for your iPad, Convenient alphabetical browsing of chemical substances in list or grid view Substance pages with key technical properties, chemical structures, and links to corresponding products on Sigma-Aldrich.com for additional information,Ability to search by product name, synonym, CAS number, and product number with alphabetically returned results Approved Drugs app contains over a thousand chemical structures and names of small molecule drugs approved by the US Food & Drug Administration (FDA). Structures and names can be browsed in a list, searched by name, filtered by structural features, and ranked by similarity to a user-drawn structure. The detail view allows viewing of a 3D conformation as well as tautomers. Structures can be exported in a variety of ways, e.g. email, twitter, clipboard Atom in a box an aid for visualizing the Hydrogenic atomic orbitals, the three-dimensional states that the electron occupies in Hydrogen, a prime and otherwise unwieldy example of Quantum Mechanics. It interactively shows what the Hydrogen atom "looks" like. Atoms in Motion a fully interactive atomistic simulation that uses sophisticated Molecular Dynamics (MD) algorithms to perform computational chemistry calculations right on your iPad. Buffers a tool for designing buffer solutions for pH control. Buffers is useful both as a handy reference of available buffering agents and as an accurate, portable buffer calculator for chemical, biochemical and biological research. CalcKit - lets you create your own personalized calculators Call For Papers helps you keep track of information about upcoming conferences and journal publications. It retrieves the data from WikiCFP, the number one community resource on the Internet, which is used by the majority of researchers and education institutions to announce paper submission deadlines The Cell Alerts iPhone application allows you to keep up to date with articles published in Cell Press research journals, and upcoming conferences in your field. Cell Imaging HD This mobile app is designed to help you find fluorescent dyes, reagents and protocols for cell biology related fluorescence microscopy applications. Chem+ is a chemical reference for your iPad. Databases Include: * NIOSH Pocket Guide (NPG) * Immediately Dangerous to Life and Health (IDLH) * Toxicity (TOX) * the Emergency Response Guidebook (ERG) Chem3D for iPad is a molecule viewing app that allows viewing 3D molecular structures, it can display PDB, MOL and C3XML files. chemCal is a basic chemistry concentration (molarity, moles per liter) and dilutions calculator for students of chemistry, biology, biochemistry, and biomedical sciences at school, college or university. ChemDoodle Mobile is a calculator for drawn organic structures. ChemDoodle Mobile calculates many properties that are useful for structure and mass spectrum analysis, including an isotopic distribution. It also simulates interactive NMR spectra that are useful for research in the lab. Now you can take the power of ChemDoodle with you everywhere. ChemDoodle Web Components, while not specifically an iPhone/iPad app these web components allow chemical depiction on all platforms. ChemDraw for iPad is the mobile version of the desktop chemical drawing package, I’ve written a review here. ChemFormula is a molecular formula and weight calculator ideal for students and anyone else who needs to quickly translate arbitrarily complex formulas into empirical formulas with molecular weights. Written by chemists, it includes support for a large number of common chemical abbreviations, functional groups, and protecting groups. ChemiCal ChemiCal is a simple chemistry application that takes a given chemical formula and returns the mass of one mole of that chemical. Chemical Safety Data Sheets - ICS This application displays International Chemical Safety Cards [ICSC] produced by the United Nations Environment Programme (UNEP), the International Labour Office (ILO), and the World Health Organization (WHO). Chemistry Formulas This application can provide every possible formulas for anyone who study in AP Chemistry, including Common ions and their charges, Equations and Constants, Chemistry Fundamentals, Atoms and Subatomic Particles, Molecular mass, Molecular formula and empirical formula, Balancing Chemical equations, Temperature conversion, Ideal Gas Laws. 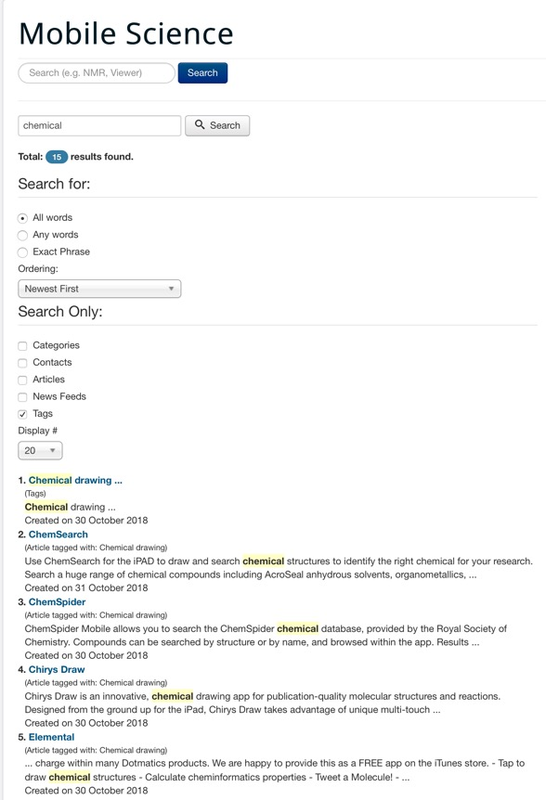 ChemSpider Mobile allows you to search the ChemSpider chemical database, provided by the Royal Society of Chemistry on your iPhone or iPad. Compounds can be searched by structure or by name, and browsed within the app. Results can be examined by jumping to the web page. Search structures are drawn using the powerful MMDS molecular diagram editor. ChemWeight - a molecular weight calculator oriented toward organic and medicinal chemists Chemjuice chemical drawing package. ChemJuice Grande drawing package and more designed to take advantage of the extra real estate on the iPad. 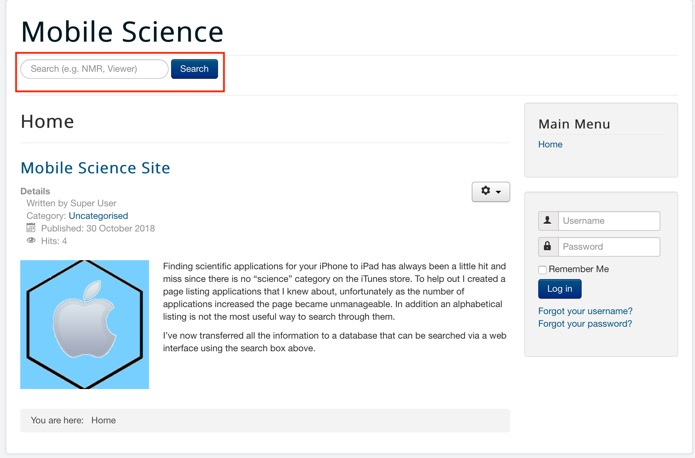 ChemMobi uses Symyx, ChemSpider and Discoverygate webservices to access online chemical information. Chem Solver Lite This app provides easy to access chemistry information and tables as well as equation solvers for almost all general chemistry equation. Chirys Draw is an innovative, best-in-class application for drawing publication-quality molecular structures and reactions. Designed from the ground up for the iPad, Chirys Draw takes advantage of unique multi-touch capabilities to make drawing molecular structures and reactions easy and accurate. Chirys™ Sketch is an innovative, best-in-class application for drawing publication-quality molecular structures and reactions. Designed and built from Chirys Draw, the iPad version, Chirys Sketch takes advantage of unique multi-touch capabilities to make drawing molecular structures easy and accurate. Clinical Trials.app is a powerful, professional search tool that provides mobile access to information on more than 98,000 registered clinical trials from the National Library of Medicine and National Institutes of Health database. CloningBench Restriction Enzyme Finder - Search by cut-site, name or buffer type, obtain technical data that you can share easily with others and order directly from your mobile device. Double Digest Finder - Find the correct buffer and concentration when digesting DNA with two restriction enzymes. Competent Cell Selection Guide - Quickly find the right competent cell for your cloning application and order easily. Search for chemically competent or electrocompetent cells, desired transformation efficiency, specialized application or packaging format that suits your needs. CMol is a molecular viewer designed specifically for the iPad, iPhone and iPod touch, offering a more powerful system for displaying and understanding biological molecules than has yet been seen on any iOS device. DataAnalysis is a general purpose iPad App for the plotting and analysis of all types of data that can be formulated as x,y pairs. The program can be used easily by both students and professionals. It is particularly useful for quick analysis of various types of data by curve fitting, analysis of data via a standard curve. Dilutions Dilutions contains several calculators that help perform serial dilutions, molar and percentage calculations as well as make SDS-Page gels. Elemental from Dotmatics a Chemistry Sketch Utility EleMints a totally interactive Periodic Table for the iPhone and iPod Touch. However, it not only offers a Periodic Table, but also a Plot Graph, Element listing, Molar Mass Calculator. Epicentral is a network-based iPhone and iPodTouch application that displays a global map (and an earthquake-activity timeline when the phone is rotated) and list of earthquake epicenters for events that occurred during the last week. View more presentations from Antony Williams, ChemSpiderman. A new paper has just been published Redefining Cheminformatics with Intuitive Collaborative Mobile App The proliferation of mobile devices such as smartphones and tablet computers has recently been extended to include a growing ecosystem of increasingly sophisticated chemistry software packages, commonly known as apps. The capabilities that these apps can offer to the practicing chemist are approaching those of conventional desktop-based software, but apps tend to be focused on a relatively small range of tasks. To overcome this, chemistry apps must be able to seamlessly transfer data to other apps, and through the network to other devices, as well as to other platforms, such as desktops and servers, using documented file formats and protocols whenever possible. This article describes the development and state of the art with regard to chemistry-aware apps that make use of facile data interchange, and some of the scenarios in which these apps can be inserted into a chemical information workflow to increase productivity. A selection of contemporary apps is used to demonstrate their relevance to pharmaceutical research. Mobile apps represent a novel approach for delivery of cheminformatics tools to chemists and other scientists, and indications suggest that mobile devices represent a disruptive technology for drug discovery, as they have been to many other industries.